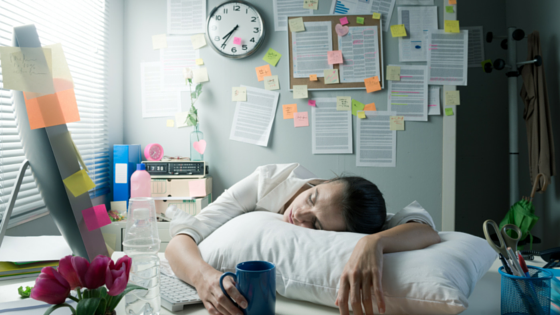 If you consistently feel like you could sleep at your desk, especially around 2:00 pm when so many of us have our midday crashes, this blog is for you. Before learning all I know now about healthy living, and following a healthy lifestyle, I could have slept at my desk every afternoon. If I’m being totally honest, I felt like this all day long, even if I got 8 hours of sleep. “If I just close my eyes for 5 minutes, I’ll feel better.” Everything is different today, because I pay attention to what my mind, body and soul needs and now, afternoons are my most productive time. Listen, this is so important because you spend 8+ hours a day at work, so wouldn’t it be great if you could stay energized and happy throughout the entire day? If you are thinking that this impossible, it absolutely isn’t! You can eat yourself happy and there is so much you can do to avoid feeling tired and sluggish at your desk. Here are five of my favorite tips for being healthy, energized and focused at work. For those of you who hate breakfast, I can feel you cringing, but skipping breakfast is one of the top culprits for low energy, brain fog, lack of focus and unhealthy cravings. Your body and your brain need food at least an hour after you wake up. It improves concentration, alertness, and focus. That means no more falling asleep in meetings or zoning out on your coworkers. Choosing the right breakfast is key. You want to avoid the sugary breakfast cereals and muffins. Anything that is a simple carbohydrate, which basically means it is full of sugar, or unhealthy fat, will zap your energy. Instead, what you want is to opt for fresh fruit, smoothies, scrambled eggs with veggies, oatmeal, or chia seeds made into a tasty breakfast pudding. These will give you long-lasting energy and keep your cravings in check until lunch. If you do feel hungry between breakfast and lunch, fresh fruit or unsweetened trail-mix are both great options. Just like breakfast, eating a healthy lunch is essential. In many cultures, lunch is the biggest meal of the day. What you eat at lunch will fuel you for the rest of the day and even ensure that you don’t binge eat at dinner time. You want to choose foods that boost your energy, not deplete it. Ever feel like taking a nap after lunch? Your food choices are most likely the culprit, especially if they involve deep fried or fast foods. As I mentioned above, anything that is a simple carbohydrate will zap your energy. The best way to eat a healthy lunch is to brown bag it as often as you can – dinner leftovers are your best friend. If you do go out to a restaurant, choose the healthiest options following the tips below. I have found that my 60/20/20 rule the easiest to follow to get a healthy, balanced lunch. Anything that is a whole-food (made from Mother Earth) are great options. Drink Water, Water & More Water! Water is the most essential element we need and most of us are not drinking enough of it. You can go a long time without eating, but after a day with no water, your body will start to turn on you. You want to aim for at least eight glasses per day because it has so many health benefits, one of them being that drinking water is great for keeping you energized. For those who forget to drink, set an alarm on your phone to remind you. If you find it boring, add fresh fruit like strawberries and lemon slices. Get up from your desk at least every 90-minutes. Sitting all day without moving will absolutely zap your energy, especially staring at your computer screen for long periods of time. Our bodies are designed to move. This is a great time to get a glass of water. Get up from your desk, walk, stretch and drink – 2-minutes is all it takes. I also recommend getting outside during your lunch break, especially when it is sunny. Fresh air does wonders for your energy level. Cloudy or sunny, you will reap the energetic benefits of being outdoors and breathing in the fresh air. Oxygen = energy! Buddy walk, healthy eating challenges, weight loss challenges…whatever it will take to inspire health and wellness. This promotes a healthy workplace, and is great for teamwork and camaraderie. For those who are competitive, and love to win, this is a great motivator. Why not start a challenge today and start following the tips above for the next 30-days. As an advocate for food first, supplement second, I have never shared a product that could supplement food and I never will. However, I believe that we all need something to help us bridge the gap, something that will fuel our cells and keep us healthy and energized when we are unable to eat as well as we want/need. USANA Essentials are a simple change that can enhance your health. I am so grateful for finding something that I can eat to help fuel my body with essential nutrients on the days when I am in client meetings, facilitating workshops, or travelling and I just can’t consume fruits and vegetables as much as my body needs to keep me healthy and energized. USANA Health Sciences has truly enhanced my immunity and been an amazing addition to my healthy lifestyle. It helps bridge the nutrient gap between what you should eat and what you do eat every day. If you want to learn more about staying energized at work, preparing for great mornings, tips on how to pack your lunch, avoiding the 3:00 pm crash, cooking tips, nutrition tips and so much more, join us here: Healthy Living Program. Warning: May cause happiness!